There would hardly be a woman in the world that has read Jane Austen's Pride and Prejudice and not ended up lusting after Mr Darcy, yearning to visit Pemberley and/or craving the details of what went on post-wedding. The good news is, you can pretty much have two out of three. The bad news is, the having of Mr Darcy isn't one of them (abject denial won't help the fact that he's fictional – take it from an expert). A trip to Lyme Park in England, the estate used for the filming of the BBC adaptation, ticks one off the list and will have you frolicking with joy. The reading of Mr Darcy Takes a Wife, Linda Berdoll's sequel to the book, takes care of the other and will have you swooning in delight – not to mention feeling a bit hot under the collar. 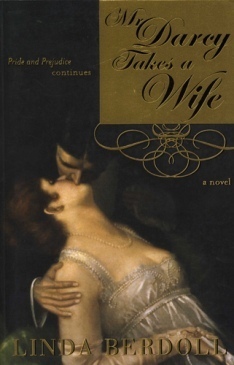 Avid Austenites will no doubt be suspicious of a sequel written by someone other than the original authoress, and rightly so – there are plenty who do it very badly. But Berdoll manages the feat of expanding the story beyond Austen's realm of experience while staying relatively true to the language of the text and the temperament of the characters. Taking up the story where Austen left off, Berdoll brings Elizabeth and Darcy to life again and adds in the elements of working class perspectives, witty innuendo and a lot of hanky-panky. You got it – Darcy is still proud and fiercely honourable, but bold Elizabeth no longer has any concerns about him being a bit stiff. Jane and Bingley on the other hand, with their less passionate, hopelessly polite natures, take a little while longer to come to grips with married life, fulfilling their connubial duties with an awkward naivety that is almost perilously comical. But it doesn't stop there. Mr and Mrs Bennet are back, in all their respective reclusivity and shrieking crassness, plus dour Mary, trivial-minded Kitty, self-absorbed Lydia and the dastardly Wickham, who is up to no good once more. There is scandal and adventure afoot that Ms Austen could never have dreamed of, but it takes place in the lives of characters only she could have created. Why? A must for anyone who doesn't want the story to end. Thank you so much for the review...I'll definitely check out this book.